Today, almost all bellman carts are purchased based on research and information users can find online. Look for a website that clearly presents and explains the features and benefits of its carts. Now, if you are not in a position to evaluate a cart in person before buying it, what are some ways that you can determine if the cart you want is truly the right choice? Glaro Inc. suggests thinking about carts in two high level categories: Aesthetics and Performance. How much does the design and finish matter to you? To what degree? What do you think your guests would expect to see when requesting a cart? What does the cart do for the building’s curb appeal? Will the finish coordinate well with your overall décor? Do you have a problem with damages to walls, doorframes and elevators as a result of improper use of your bellman carts? Is a low maintenance cart important to you? Have you been burdened with having to polish solid brass carts that tarnish? Is it important to you to have an all-weather deck covering (carpeting, vinyl, metal etc.) that will stand up and stay attractive when used outdoors? Are replacements parts readily available from a reliable American source? Is it important to you to have your company logo on the deck carpeting? Is the cart going to be used for self-service or will bellman staff use the carts for guests? Will the cart primarily be used to transport luggage or for in house utility purposes e.g. moving equipment? Will the carts fit into your elevators and through doorways? Will it maneuver well in and out of the elevator? Will the carts make smooth, tight turns or maneuver easily throughout the facility? Are you concerned with how easily a bellman cart moves while under a heavy load, especially in a self-service situation? Has pushing, pulling and steering a cart been a problem in the past? Would you consider a 6 wheel cart if it made moving luggage significantly easier, even with a heavy load? What are the wheel tires made of (rubber, plastic, vinyl etc.)? Are the tires durable and non-marking? 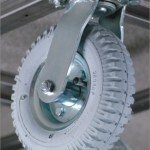 Do the wheels have a quality ball bearing construction so that they don’t chatter, wobble or bind? Does the cart need to move over rough or uneven surfaces that would imply a need for pneumatic wheels? Does the cart have a solid, non-marking bumper system? Is the cart manufactured by a company with a strong reputation in the market for quality? If you ask yourself these questions, you will be much more likely to make the right decision when shopping for bellman carts. Good luck!